34 74550-2689 - 7/16 Round/axle Bushing (black). 74440-9279 - Large Parts Bag No. 2. 74460-9249 - Small Parts Bag. 74460-9219 - Large Parts Bag 1 (n/a). 74460-9259 - Small Parts Bag (n/a). 48 78490-4029 - Battery Retainer. 48 74440-4019 - Battery Retainer. 8 0801-0711 - Thermal Fuse. 20 74460-2699 - Dash (n/a). 28 74460-4029 - Steering Column N/a. 46 74460-2359 - Dash Plate N/a. 39 73233-2279 - Taillight Lens Set. 59 0801-0224 - 8 X 1inch Screw. 56 0801-0220 - 10 X 1inch Screw. 47 0801-0309 - No.10 X 3/4in. Screw. 6 0801-0605 - Bolt 5/16 In. X 3 1/2. 19 0801-0257 - Hinge Pin. 0801-0467 - 1/4in. X 1-1/2in. Roll Bar Screws (n/a). 57 0801-0221 - No. 6 X 1-1/2 In. Screw. 54 74460-21790 - Knob Plate N/a. 44 74460-2339 - Headlight Lens Guard. 74460-0920 - Use & Care Manual (n/a). 40 73233-2759 - Taillight Housing Set. 28 74460-4129 - Steering Column. 24 74440-9829 - Footboard Assembly. 30 74450-9219 - Sport Bar. 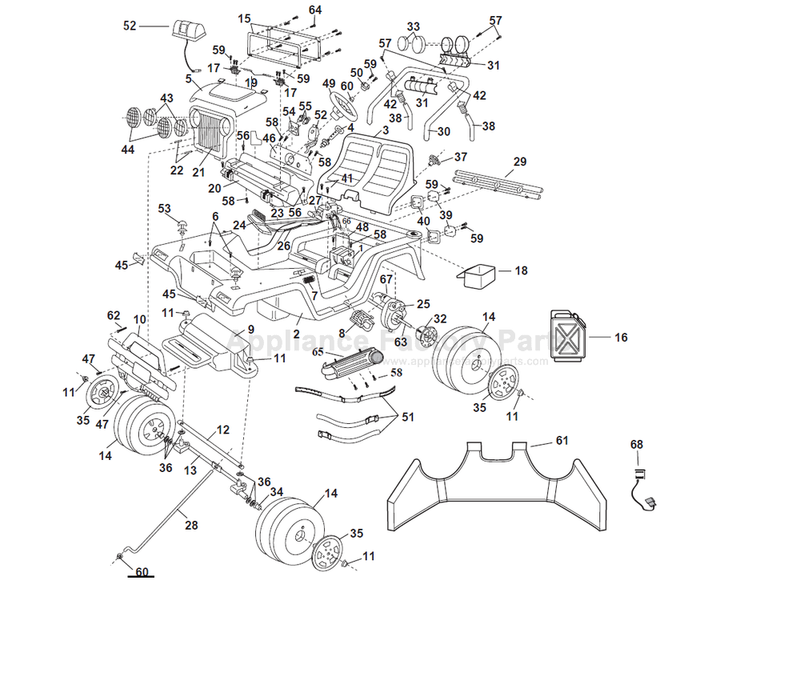 38 74440-4229 - Sport Bar Support. 45 74440-2349 - Turn Signal Lens. 15 74460-9619 - Windshield - Front/rear. 17 74270-2639 - Windshield Hinge. 24 78490-9829 - Footboard Assembly. 29 74270-2039 - Rear Bumper. 42 78490-2179 - Sport Bar Bracket Set. 61 74460-9599 - Canopy Assembly With Bag. 2 74460-2109 - Body (n/a). 3 74460-2309 - Seat N/a. 74460-0300 - Label Main Sheet N/a. 74460-2239 - Lock Fastener (n/a). 60 0801-0604 - .354 Black Retainer/cap Nut.